Hello! I had a little crafty time last night and whipped up this bright and cheery card. 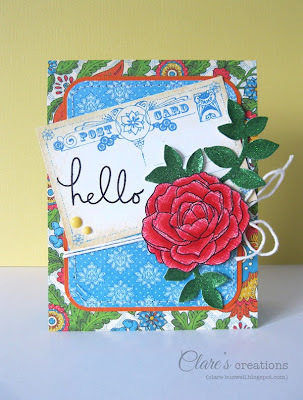 I'm loving the Bohemian Bazaar Collection from Graphic45, it arrived in the mail with a few other goodies yesterday. The colors and patterns are amazing in this collection, I got the 8x8 paper pad, it's a really great size. The postcard is also from the Bohemian Bazaar Collection paper pad. 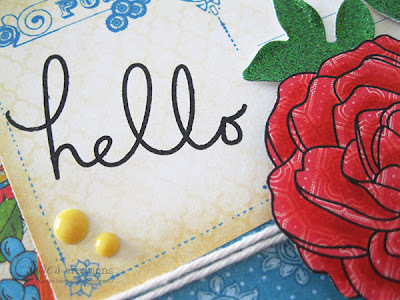 The fab sentiment is from one of my new favorite stamp sets Circle It from The Craft's Meow. It goes so well with so many different styles, it's a great set to have in your stash! The flower is from Happiness Is stamp set also from The Craft's Meow, I stamped it directly onto some patterned paper (from the same Collection) and added some subtle shading with Barn Door and Worn Lipstick Distress Markers. I also added some enamel dots (I finally got some!!). I don't know about you but I love to add a touch of sparkle to my cards but I'm usually put off my the mess glitter makes, so I have to say that I'm totally in love with Glitter Silk Cardstock from Core'dinations. 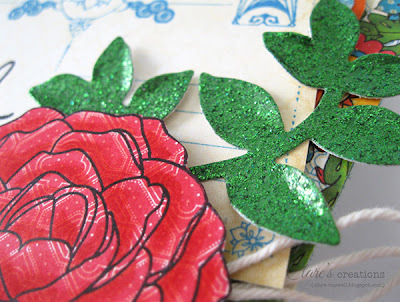 You won't find a speck of loose glitter on the smooth surface and it die cuts like a dream. Check out all the stunning colors available here. I can't get enough of it!! 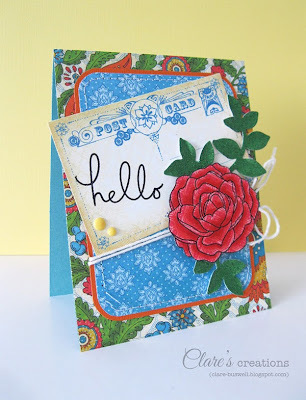 I used Leafy Accents Die Collection from Clearly Besotted Stamps to die cut the leaves. I also used some cardstock from The Vintage Collection from Core'dinations for my card base and the orange cardstock is from Core Essentials Brights. Oh and if you're on Facebook, I just set up a page for Clare's Creations, I'd love it if you'd pop over and like my page! You'll get all the latest updates on what I'm working on, sneak peaks etc! : ) Ok, thanks for dropping by my blog and have a great day! What a bright a cheery 'hello' card Clare! love the papers and that great post card - the rose is beautiful! This is so pretty. That rose is gorgeous and you've used such pretty papers. Lovely card. Love all the bright color.